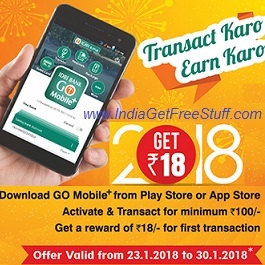 Participate in IDBI Bank Transact Karo Earn Karo Offer and get free Rs.18 credit to your account. Daily first 2018 customers who Activate and Logs into the IDBI Bank Go Mobile+ App for the first time and transacts for a minimum single transaction value of Rs.100/-and above will be shortlisted for the reward. After the completion of the offer period, winner selection will be on the basis of transaction timestamp for the newly on-boarded users during the campaign period. Amount will be credited to the customer’s account from which the first successful transaction was initiated during the offer period. Offer Period: 23rd January 2018 to 30th January 2018. NOTE: This campaign offer is exclusively for Go Mobile+ Application. Maximum of 16144 (2018 users* 8days) customers during the offer period will be rewarded for the promotional offer with incentive of Rs.18/-. Transact for minimum Rs.100. Eligible transactions include Self account or Third Party Funds Transfer or IMPS or NEFT or IDBI Bank Credit Card or Visa Credit Card Payment or Mobile or DTH Recharge. An SMS and Email will be triggered to the winners informing them of being among the shortlisted winners. The Reward of free Rs. 18/- will be credited to the Customer’s account within 45 days from the end of campaign. The reward will be given to those customers who activate and login into the Go Mobile+ App for the first time and perform at least one of the eligible transactions for minimum single transaction amount of INR 100/- during the period. The bank has the right to withdraw the Offer without any prior notice. Grievances if any with regard to the offer will be entertained only up to 31st Mar 2018. For any queries/communication regarding the Offer, contact at IDBI Bank Customer Care Toll Free Number .